Stripes, yes, but so engaging on the eye. There’s a sense here that we’re looking at a section of a long, long ribbon of stripes. We feel privileged to see at least some part of it. The section we get to see triggers curiosity about what came before at the left and what comes next at the right. The desire to see more is only natural, since what we have in front of us is so much fun to look at. Look at how adventurous the edges are, for example, the horizontal brush strokes at the upper left edge of the white stripe and the sliver of turquoise between the white and red just below the middle. This painting seems very colorful to me, but that’s an illusion. Most of the surface is white-ish and a brownish black. There are two thin ocher stripes. And then there’s that wide red stripe. 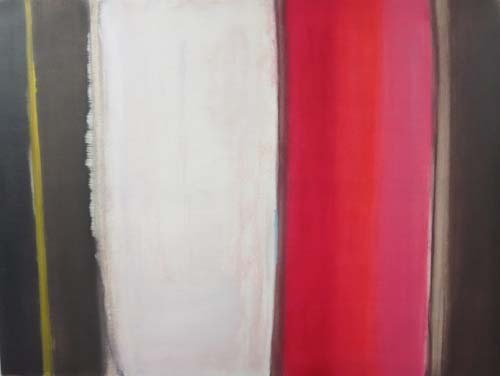 But that consists of three shades of red and the effect created is one of depth, absorbing the viewer and letting the eye sink deep into a recession of space. 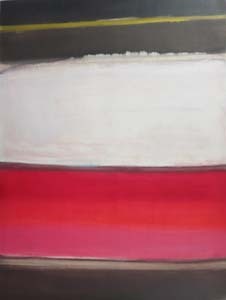 Much of the energy of the painting derives from the fact that the stripes are vertical. To test this, look what happens when the painting is rotated 90°. It becomes flat and tired.